In the vein of chivalry, they decide to do 'ladies first'. You re introduced to afro Misty (we've had a love/hat thing going on for years) and undercover Ororo Monroe. 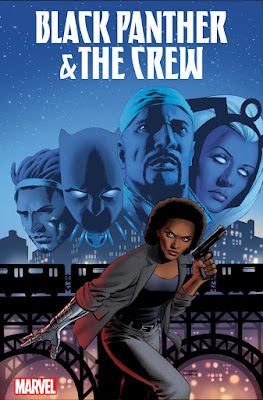 You get a little history of Misty Knight, her feelings on being a cop and her feelings about Harlem. Misty is closer to her Netflix counterpart than her Sam Wilson Capt America persona (my opinion). It seems a little odd at first because you have the same character in the same universe ( comic book universe) with two different personalities. Typical of comic books unfortunately. Oops tangent. Ororo is more in the book than Storm. I say that to mean that you look at the character and think it's Storm, but you (I) wasn't sure till later on in the book. I like the fact that the book looks at Ororo's american roots a bit. Remember, her father was an american photographer ( photojournalist?) and she does have some 'family' in america. They have always concentrated on her mother's family; has her father's side ever been explored ( uncles, aunts, grandparent, etc?). You also get a history about Harlem. How there have been heroes in the neighborhood for a long time. And how heroes get destroyed. There are other aspects of the story that I won't get into because it hits a little too close to home, but the book is an enjoyable read. I like that they take it back to the streets. There are a lot of levels to the human and superhero experience; and all should be explored. I love that they are taking two characters ( T'Challa and Storm) that EFFECTIVELY work on both a cosmic AND street. It was a good start and I look forward to the other 're-introductions' and the Crew coming together as a whole to take back the streets!